So I typed “joy” into a google image search just for the hell of it and, after scrolling down through all the people “jumping for joy” I found an image from an inspirational website that uses mind mapping images to illustrate stuff that is . . . well inspirational I guess. The first one I saw was a “joy” map, which was pretty cool. It was quite simple, both in structure and content, which I think is necessary for a joyful life. (Others may find joy in complexity, just not me). 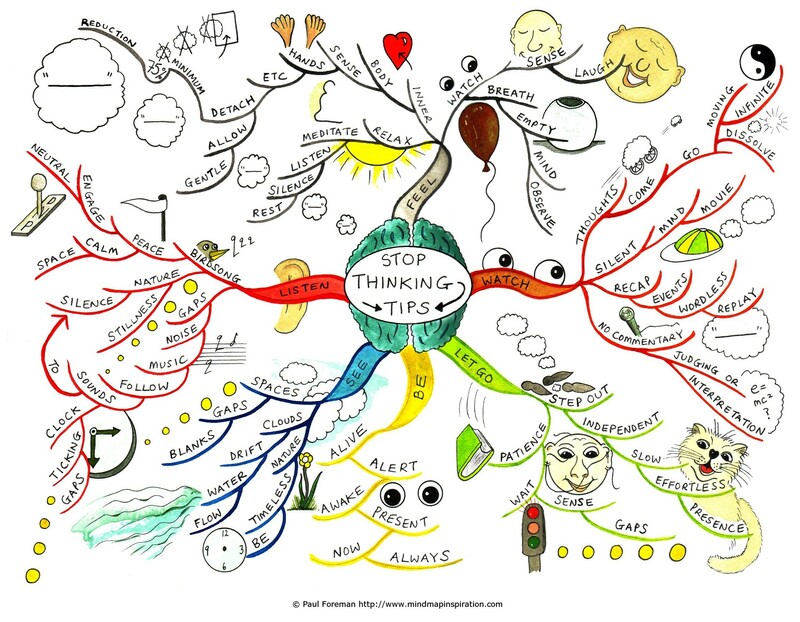 But then I found this map: the “Stop Thinking Tips” map that is at least twice as complex and filled with ideas as the joy map. Which begs the question: how can such a mass of ideas possibly help anyone from thinking too much. If you need tips on how to stop thinking, then you’re going about the problem the wrong way. This entry was tagged irony, joy, mind mapping, peace. Bookmark the permalink.